There’s rich irony in the efforts by members of Congress to eliminate federal funding for bicycle trails and other amenities for cyclists: It was, after all, cyclists who literally paved the way for the age of the automobile. In the years shortly before and after the turn of the 20th century, Americans and Europeans in the millions took to a new-fangled machine called the bicycle. And when they found that primitive roads limited their mobility, they took action and became a political force to be reckoned with. 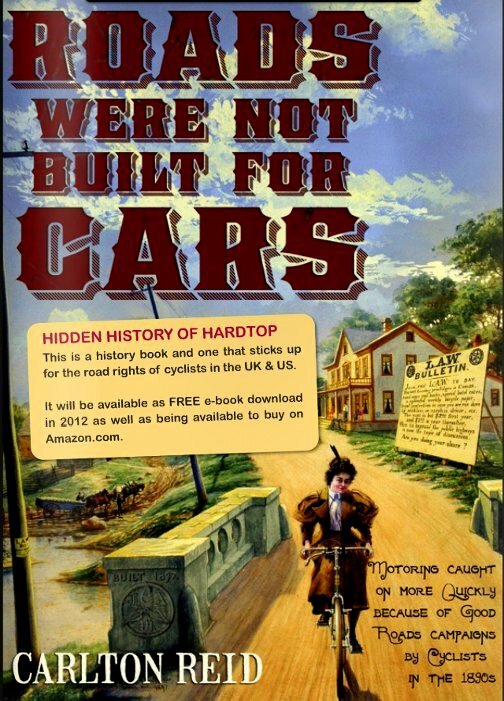 A soon-to-be published book by Carlton Reid, Roads Were Not Built For Cars, tells the story of how bicyclists became a powerful special-interest group in the United States and Britain during that turn-of-the-century period of transition from horse-powered transport to motorized vehicles. 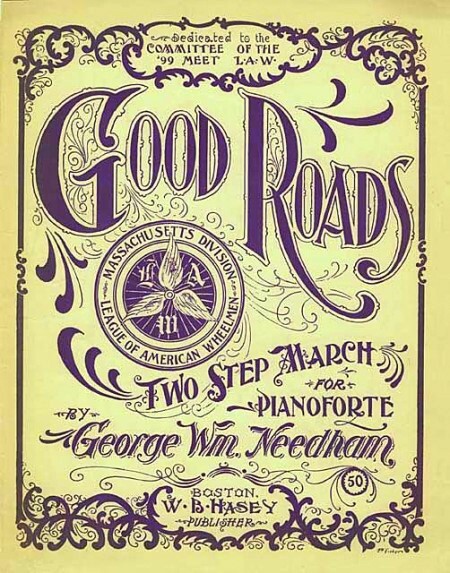 In the United States, the cyclists’ lobbying effort resulted in the Good Roads Movement. In Britain, the Cyclists’ Touring Club founded a lobbying group called the Road Improvements Association in the 1880s with much the same goals as the Americans: to make bicycling safe and enjoyable – on good roads. “Motorists are the johnny-come-latelies of highway history,” Reid writes on a website promoting his book. “The coming of the railways in the 1830s killed off the stage-coach trade; almost all rural roads reverted to low-level local use. “Cyclists were the first group in a generation to use roads and were the first to push for high-quality sealed surfaces and were the first to lobby for national funding and leadership for roads,” Reid writes. So I guess we can thank bicyclists for helping launch America’s century-long love affair with the automobile. Some seven decades into that love affair – as cities became more congested and the air more polluted – bicycling began making a comeback, spurred by the efforts of such organizations as Adventure Cycling Association and the League of American Bicyclists. But now much of that progress over the past few decades is in jeopardy. Which brings us back to what’s going on in Congress. A bicycle ad from a catalogue of Sears Roebuck & Co.
A House version of a long-term transportation bill working its way through Congress, officially called “The American Energy and Infrastructure Jobs Act” and written largely by Republicans who control the chamber, is – as might be expected – great news for the oil companies that supply our cars with fuel and terrible news for advocates of public transportation. Bicycling magazine summed up how provisions of the bill would affect cyclists and pedestrians. • Completely reverses 20 years of bicycle and pedestrian-friendly federal transportation policy. The League of American Bicyclists sponsors the National Bike Summit in Washington, D.C.
• Completely eliminates the dedicated funding for the Transportation Enhancements program that funds the cycling and walking projects. • Allows states to build bridges without safe access for cyclists and pedestrians, as previously required. • Completely eliminates Bicycle and Pedestrian and Safe Routes to Schools coordinators in state departments of transportation. • Repeals the Safe Routes to Schools program. 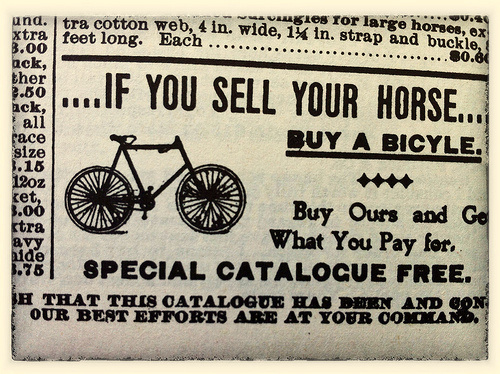 How’s that as a thank-you to cyclists for getting our nation’s road system up and running? NOTE: The e-book Roads Were Not Built For Cars is planned for publication in April. As the book’s website says: Thanks to research grants and advertising support, it will be free to read online and free to download to Kindles, iPads, iPhones and other e-book readers. The free distribution model will be used in order to get the book seen by as many eyes as possible. Ah the irony of it all!! 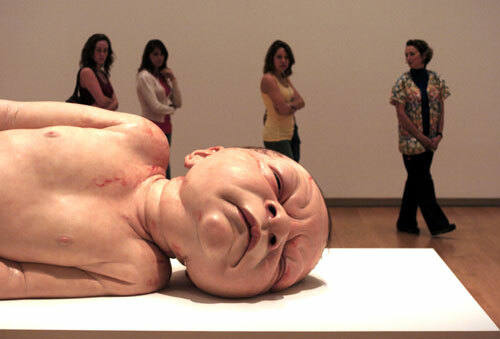 Maybe we can gain it back.